Jordan Motorsport lost the longest stage of the Jordan Rally to inclement weather conditions in the region, but that failed to prevent Nasser Saleh Al-Attiyah from storming into a comfortable lead of 4min 20.9sec after five slippery gravel stages of the opening round of the 2018 FIA Middle East Rally Championship on Friday. Heavy overnight rain forced route modifications and the loss of the 30-kilometre Palms special that was scheduled to run twice, but the Ford Fiesta R5 driver and French navigator Matthieu Baumel won all five of the day’s timed tests that did take place to remain firmly on track for a record-equalling 12th victory in the Hashemite Kingdom. Vojtĕch Štajf and Markéta Skácelová had a baptism of fire in their Škoda Fabia R5 and were never able to match the pace of Al-Attiyah on the driver’s second ever gravel rally with his R5. He lost over three minutes with a puncture in the fourth stage and slipped to third overall on his Jordanian debut. “We only took one spare with us. On the second loop, on the Mahes stage, we had a puncture about six kilometres in from the start. There was a big rock lying in the line. I did not see it because it was at the end of the corner. Nasser said he saw it as well. We hit it with the left-front and the tyre was flat within a few hundred metres. Kuwait’s Meshari Al-Thefiri was the class of the MERC 2 field in his Mitsubishi Lancer Evolution X with Qatari navigator Nasser Al-Kuwari and moved up to second place after the Czech driver’s problems Al-Thefiri won every stage in the showroom category and reached the overnight halt 3min 27.7sec clear of the Jordanian crew of Khaled and Emad Juma in a similar car. 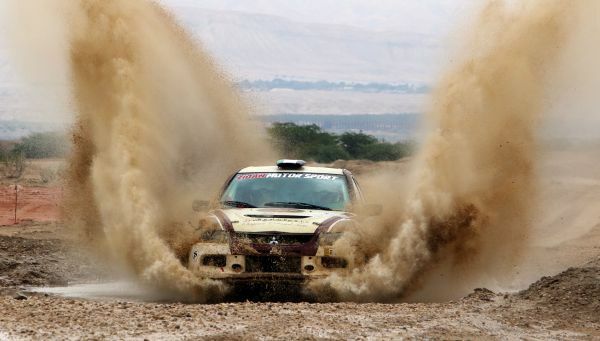 Ahmad and Shadi Shaban were a distant fifth overall in their Mitsubishi and third in MERC 2. Fellow Jordanians, Ihab Al-Shorafa and Yousef Juma, rounded off the top six in another Mitsubishi Lancer derivative. Lebanon’s Henry Kahy and Jordanian co-driver Musa Djiyerian held seventh overall in a Group A Škoda Fabia, while local driver Asem Aref, co-driven by Faris Tal, guided his little two-wheel drive Renault Clio RX to eighth place without fifth gear. 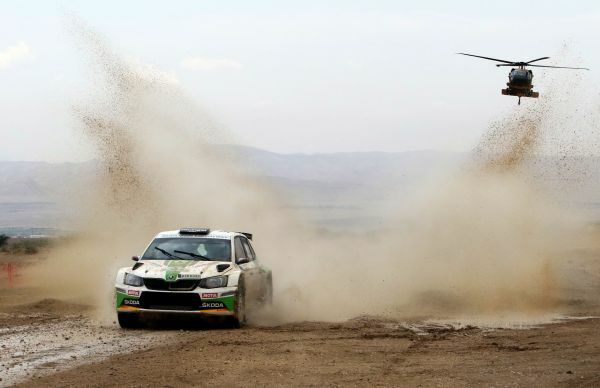 Salameh Al-Gammaz led the way in the Jordan National Championship category from Zeid Miqdad after Tareq Al-Taher retired his Mitsubishi in the fourth stage with electrical problems. 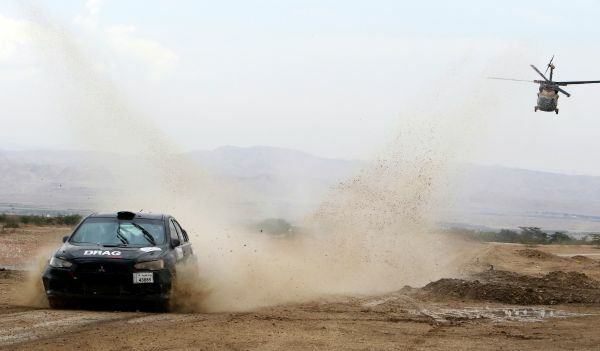 Abdullah Al-Rawahi’s experience of Jordanian stages was short-lived when the Omani slid his Subaru off the track in the middle of the first stage of the morning and retired. He will restart under Rally2 once a bumper and rear suspension arm have been replaced. Sweep crews worked well after nightfall on Thursday to check each of the stages for flood damage and standing water. 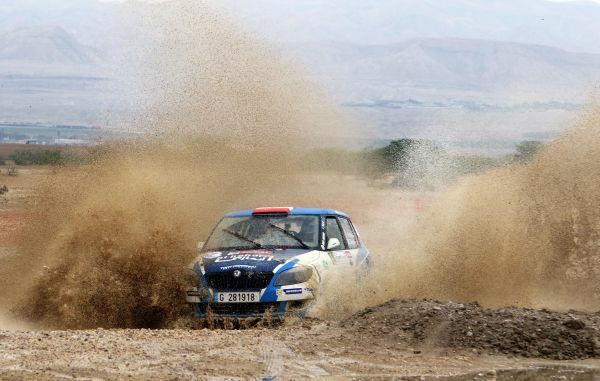 Rally officials had no alternative but to cancel the 30.23km Palms special, as the Jordan River valley was carrying excess run-off water and parts of the track were inundated. The decision reduced the day’s action by over 60km but crews would tackle two runs through both the Mahes (19.00km) and Baptism Site (11.68km) specials as planned with a 90-minute change to the time schedule to the stage start. A third run through the Baptism Site stage was added in the afternoon to increase the total stage distance by 11.68km. Al-Attiyah posted the target time of 14min 56.7sec through the belated opener, as Al-Thefiri laid down the MERC 2 gauntlet with a 16min 27.8sec. Štajf’s first experience of Jordanian gravel saw him finish the special 1min 01.3sec behind Al-Attiyah, but the Czech slotted into second overall. The day’s action ended prematurely for the Omani Abdullah Al-Rawahi after his Subaru Impreza slid off the track just over nine kilometres into the stage. Raed Al-Edwan retired from the day’s National Rally action after an incident involving his Arctic Wildcat on the road section to the special stage, while Al-Shorafa lost a lot of time to his MERC 2 rivals on what developed into a dramatic start to the rally. Al-Ghammaz moved in front of Al-Taher in the National Rally category. There was no Baptism of fire for Al-Attiyah on the first of three runs through the 11.68km special and the defending champion carded a time of 6min 53sec. Al-Thefiri consolidated his MERC 2 lead by finishing the special 11.3 seconds behind the Ford Fiesta R5 driver, despite incurring a 20-second time penalty for changing tyres. 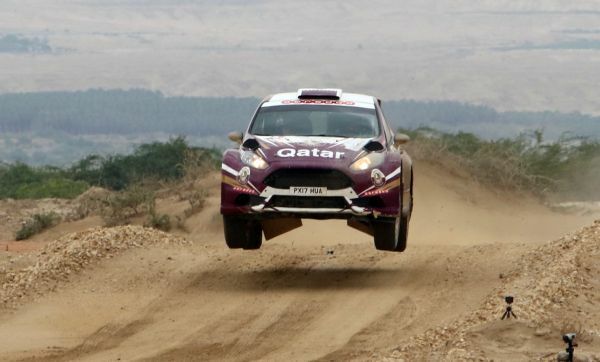 Štajf ceded another 7.3 seconds and trailed Al-Attiyah by 1min 10.3sec before the return to service at the Dead Sea, although the Qatari admitted that the Ford had lost power after the water splash and was concerned that it may have a sensor issue. “The stages are a lot softer than usual and there is some standing water in places, but not too many problems on those two stages,” said Al-Attiyah. The two stages were repeated in the afternoon, in addition to an extra run through the Baptism stage. Al-Attiyah was five seconds slower than his morning run through Mahes but headed to the second Baptism test with a lead that grew to 3min 18.6sec after Štajf dropped a further 4min 51sec in the special after sustaining a flat tyre. Al-Thefiri was 17 seconds quicker in the afternoon and extended his comfortable MERC 2 advantage and snatched second overall at the expense of the Czech, who found himself tied to the second for third place with Khaled Juma. Al-Attiyah stormed the second of three runs through Baptism in improving conditions and was 28 seconds faster than he had been in the morning. His lead grew to 3min 50.5sec, as the remainder of the field held station, and he beat his time yet again on Baptism 3 to take a lead of 4min 20.9sec into the overnight halt.